After technical training as an engine specialist on reciprocating engine aircraft (prop. aircraft) at Sheppard A.F.B. in Texas I was sent to Manhattan Beach A.F. Station in N.Y. for a month, then put on a ship USNS (Alexander M. Patch) bound for England and arrived at Southampton 6 days later, I stayed at a base in a nearby town for a week then bussed north for 4 hours then transferred to a G.I. truck and travelled for another 2 hrs. and arrived at Burtonwood A.F.B. I was here from 1955/ 1957 on this airbase. When we arrived at Burtonwood RAF Base myself and two other airmen, Elmus F. Walker (country) & John Stender we reported to Colonel Graves in the orderly room on site 5 and were informed that there was one opening for hangar #5 and three engine specialists before him so he had us draw straws, the shorter straw would go to hangar 5 the other two would go to transit alert, I drew the short straw and was assigned to hangar #5. I had been at hanger 5 for about two weeks when John Carey and I did our first cylinder replacement on a C-54 that had just arrived for service. John was in tech training with me at Sheppard AFB in Texas, he arrived at Burtonwood a week before me, we left New York the same day (he flew, I had to swim) That was the start of doing repairs that we were trained for at tech school, repairs in the hangar, flightline and at other air fields where a/c needed repairs to get back to their respective air base. That was the only time that John and I worked together on an aircraft, we both worked out of hanger #5 while at Burtonwood. While stationed here I was assigned temporary duty (T.D.Y.) to Edinburgh Scotland to replace an engine that conked out, t.d.y. duty to an island (Tiree) off the coast of northern Scotland and replaced an aircraft engine, t.d.y. to Prestwick A.F.B. Ayr, Scotland to replace an engine cylinder. I was sent with 9 other G.I. 's to Scotland on reclamation of an aircraft that was returning from weather reconnaissance mission in the north Atlantic airspace & crashed outside of Kendal in Scotland, we removed cameras, navigation equip. cut up the remaining aircraft loaded it on flatbed trucks & returned it to Burtonwood, Also I went t.d.y. on assignment to repair & return aircraft that were in Iraq but the local government refused to allow us to disembark our aircraft (I never got the chance to thank them). These are just some of the things done while stationed at Burtonwood, there were many others, on and off base. While stationed at Burtonwood I had the opportunity to meet the local hospitable friendly towns people of Warrington, they were very friendly to the yanks, I felt right at home. This is where I met Dorothy Tyrer, once twice three times the lady, she lived just outside of Warrington in a the village of Thelwall where I spent much time, we married and remain happily together, I still remember the numbers of the bus I used to take to get to her house there were three ways to get there, The Westy 19, the Grappenhall 6 and the one that used to drop me off just past the front of her house, the Thelwall 2 bus. In early 1950 the French offered the U.S. a base in France that was in better proximity in Europe, in the late 1950's the G.I. 's at Burtonwood were scattered, Germany, France, U.K. Africa etc. I was sent to France, then Germany, Eventually Burtonwood A.F.B. closed. 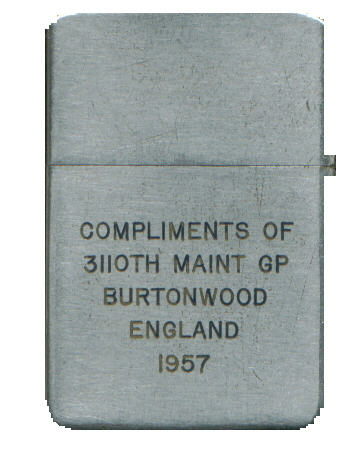 I still have my 1957 lighter from the 3110th Maint. Gp.